That statement, the same one daily, would instantly transport my young, innocent mind to stray dogs on the street, waiting for nightfall and then preying on each other. The weaker ones scurrying under the dirty sewage gutters to hide till daybreak, their tails between their legs, yelping softly, scared. At daybreak, they would slowly crawl out and hide, safely amongst the traffic. The meek ones ended up as carcasses. Picked through, bone for bone, blood smattered as the telltale sign of the kill. Being magnanimous in death, by feeding not only the killer, but also the scavengers. Cawing blackbirds, gnats, flies, maggots and sometimes I imagined, even the wasted, emaciated beggar at the end of the street. My name is Lakshmi. I lived in a house with two bedrooms, one bathroom, a living room and a kitchen, with my sister, Durga and my parents. We had no dogs, no birds and definitely no cats. Sometimes a rat would come scurrying into the house when we left our precariously balanced mesh screen door open, but then everyone had rat trouble on my street. Catching the rat, killing it and getting rid of the putrid smell that reminded us of its existence, took up an entire week. There was no doubt that the first few seconds after a rat sighting was filled with disgust and even abhorrence. But the game after that required careful planning. The setting up of traps each one more innovative than the last. Days passed in careful anticipation, until Snap! It was time to savor sweet victory. The thrill of watching the rat writhe in pain, after rushing to his death in a moment filled with greed and weakness for that one morsel of food, signified the end of a carefully plotted game in which there could have only been one victor. Appa would then put the dead rat into a plastic bag and walk to the end of the street to the big trash can and throw it there. In seconds, blackbirds would swoop down from the trees eager to taste this new treat. The next couple of weeks passed by with stories of how the household managed to outwit the twinkle toed rodent and the last few days of the month would involve some neighbor or the other enquiring after our war strategies and our arsenal. I was named after the Goddess of Wealth. By naming their first born after the Goddess, my god-fearing parents hoped to bring home not just their bundle of joy, but also wealth, grandeur and good fortune. It was their way of greasing the palms of the lords, for a favor. Here they were naming their child after one of the most powerful deities and all they asked in return was some extra money to make sure they didn’t have to worry about house loans, motorcycle loans and, when they had two girls, marriage loans. My mother’s sister always told the story of how when she and my mother were pregnant and I was born a few days before her own daughter, my mother insisted on naming me Lakshmi, when she knew how much her sister wanted the name for her own daughter. By a matter of a few days we had won the right to bribe the lords. My aunt never let us forget that. When four years had passed and we still hadn’t won the lottery, my parents decided the Gods needed to be placated some more. So they decided to bring home another baby. But this time instead of asking for money, they asked for strength. My sister is named Durga, after the Goddess revered for power, invincibility and strength against evil. The way they saw it, even if they didn’t win the lottery, they would have the strength to face reality. With two powerful goddesses at home, you would think Appa and Amma, would lead a celestial life. Appa was an officer in a government bank and Amma taught mathematics at the local government school. Appa would get up early every morning, offer his prayers to the lord optimistically, read the newspaper while sipping his morning coffee, eat breakfast and get on his scooter to go to work. He would come back home in the evening, wearing the world he had seen on his face, his complexion a few shades darker. Amma would take the bus which would be crowded both ways. But at least she had friends on the bus who she could talk to, gossip and more often than not compare lifestyles with. Every day she would come back with a story a little more malicious than the day before. She would tell it to Appa while they drank their evening cup of coffee. Durga and I would pretend not to listen while doing our homework. But the minute the story session began, our eyes would stay focused on the books but our pens would stop writing. On Wednesday, it was time to hate someone for their good fortune. At home, we learnt that we were better than everyone else. At least Appa was not having an affair or we were not losing our money in some fund. And we knew Amma has not seen any new gold jewelry in quite a few years. It gave Durga and me a false sense of pride in our lower middle-class status. That was until we went to school. Durga and I studied in a small private school that was run by the church. It was so authentic, it even had a chapel, where we would all assemble when a bell was rung, in the morning, and say the Lord’s Prayer. Most of the girls did not say it, because they thought they were cheating on their own gods. They did not pray to Jesus, they prayed to Ganesha. There would be a low rumble of incomprehensible mumbling and then suddenly a loud united, “Amen!” We even had some nuns who were always dressed in long, light-brown frocks and wore a white veil covering their hair. We had to call them Sisters. They loved to publicly humiliate students. Every morning, as we walked in a single line, arm distance apart, to the chapel, they would inspect our shoes, our hair, uniform and nails. Shoes had to be polished, uniform had to be ironed, no nail polish and nails had to be cut and most important of all, if your hair was longer than shoulder length it had to be tied, braided and fastened with black ribbons. Wednesday was white uniform day. A day designated for physical exercise, and by a wise man’s logic, that meant the whole school had to wear white. It was ironic that the purity of white created deep class lines, slotting students into groups according to financial status. Needed funding for a new building on campus? The fundraiser requests would go to the parents of the girls with the whitest uniforms. Their parents were wealthy enough to buy bleach for the uniforms. Most middle class families only bought blue liquid to wash white clothes since it was cheaper.The problem was, one tiny, extra drop and clothes would be cursed to wear a bluish tinge, never to be white again. That one errant drop, gave away the closely, guarded secret, and cursed the poor unsuspecting student to wear her family’s financial status. Girls who would repeat this eyesore of an offense were asked to step out of line and grouped to one side of the auditorium, in full view of the whole assembly, berated from the microphone, while their classmates looked on and giggled mercilessly. Towards the end of the assembly, while students filed out of the auditorium, the offenders were taught a social lesson with a swift blow to their palms with a wooden ruler. 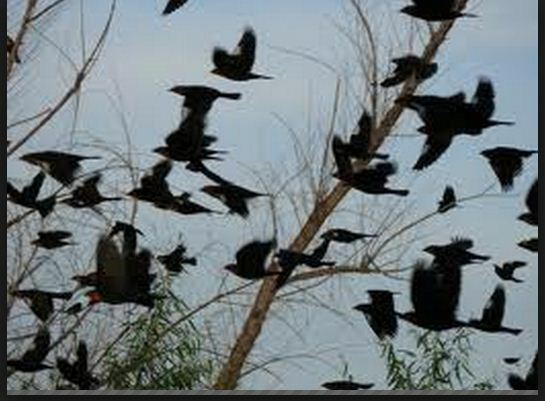 That loud, clap of the ruler on soft skin and the ensuing shriek would always send the cawing blackbirds, pecking at corn in the chapel quad, flying back to the more tolerant skies. Over the years, Durga and I had both come home with marks on our palms. Even though we were mocked and reproached we never thought to blame our parents. We were brought up to compartmentalize. Painful incidents and memories just slipped into their appropriate boxes. Problems in school was one such burgeoning compartment. More mine than Durga’s. She was always more forgiving than I was. She was also so serious, rarely smiling. Like she was mentally making notes about every situation in her head. Notes that she would someday pull out, read from and in doing so, shock all those present. If anyone in the family needed to know when something happened, we all just asked Durga. Her notes always had the answers. So she remembered just how many times both of us were punished at the morning assembly. I think it was after her sixth time, that she decided she had had enough. She was determined to do something about matters that she was too young to even understand. For a whole month, she relentlessly scrounged around the house collecting coins. She would check every nook and corner, pockets and purse, she even stopped Amma from dropping a coin into the beggar’s bowl at the temple. That small token of charity went right into her pocket. No coin was too small for her singleminded goal. At the end of thirty-one days Durga had collected a small fortune in small change. She took her fortune to Amma on a Tuesday and threatened to stop going to school the next day if her uniform was not washed with bleach and just as white as the rest of her class. For a while after that life was pretty good, no more punishment and our palms got a well deserved break from the soreness. For a while the blackbirds stopped feeling sorry for us and we only saw them silently, pecking corn steadfastly as we walked past them. I remember it was an oppressively warm morning. The kind where you wake up drenched, the sheets smelling of stale sweat. It was Saturday. A day that meant an hour of warm coconut oil massage to sooth our warm scalps and condition our long, black hair that would be followed by an extra long bath. It was around ten am. Appa was turning the pages of the newspaper, sighing, shaking his head, clucking his tongue. Durga and I were sitting close to him, forced to do some early morning studying. Amma was busy cleaning and cooking, a dust mop in one hand, a ladle in another. A portly figure, waddling through rooms. An ominous caw from outside. That was the moment. Appa stopped turning the page. He leaned in, focused on one section and he let out this loud, guttural sound. Not understanding the gravity and intensity of the moment, Amma answered from the kitchen. It was not until moments later, when Appa started reading aloud, that she entered the room, pale, holding her weapons in either hand. From where Durga and I were sitting, we looked up at Amma. Despite all her gossiping we knew Amma had spent a lot of time with Manisha riding the bus to work for close to ten years. We knew they were close and knew Amma was about to cry. With that, she returned to work leaving us with a fleeting caw and a flapping of wings that were in a hurry to get to a more merciful sky. wow! i did know can write but never thought your imagination could go into this height. good work keep up.